Drowning, not waving – For the fainthearted . . . The aversion started at primary school. 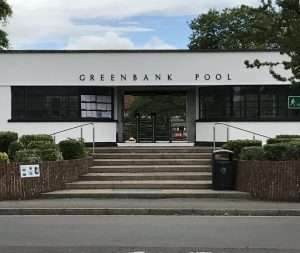 The pool was a matter of pride for a very small country primary school; it was a subject of dread for an asthmatic boy who would not finally learn to swim until he was 38. The pool was above ground level, a metal frame held in place blue plastic walls which bulged with the weight of the water. The concrete base upon which the pool was set must have sloped downwards because one end was deeper than the other, although not so deep that it was difficult to keep one’s feet on the floor. It was the “water” that was the problem; it seemed to be a solution of one part tap water and two parts chlorine. It induced stinging in the eyes and shortness of breath. 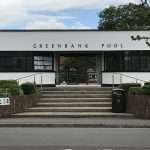 Going into the swimming pool was not, however, an option; everyone was expected to attempt to learn so as to gain a certificate for being able to swim 25 yards. The summertime humiliation of going to a swimming pool continued at secondary level. Going to school in Street in Somerset meant having to go to Greenbank pool, a place of Art Deco architecture that was undoubtedly a great innovation when it was opened. Open air, it offered no protection from the indifferent weather of an English summer. Only the larger class groups allowed those of us who had not learned to swim to hide and to shiver in the shallow end. Strangely, the PE master responsible for the ill assorted group of boys was reputed to be a non-swimmer himself. Whether or not his swimming was strong, when a boy was in trouble on the day of the school swimming gala, the master jumped fully clothed into the water and climbed out carrying the boy with him. Walking through a town one day years later, the air conditioning outlet from a fitness club brought scents of treated pool water evoking those dreaded moments of school swimming lessons. It might have been 1st August today, but there was a chill in the air and the skies over Somerset were mostly cloudy, only a patch of blue hinting that it might become warmer. Parking opposite Greenbank Pool a flood of memories came back, mostly memories of the dread that filled the heart when being one of a line of schoolboys having to face the chill water. Despite the weather, families were going through the turnstiles and setting out there things for the day. The pool has been enhanced with water park facilities, children appeared to be having fun. None of them would be thirty-eight years old before they learned to swim. In Ireland people were sent to one of the CoCo pools. For me that meant a trip to Thurles along with a busload of others who couldn’t swim. And that meant 80% kids and the rest allsorts of ages. Odd looking back on it now given all that went on. Anywoos, the same stuff was used to fill the hole for it seemed the fear was the costs of emptying the thing if the bacteria levels began to feaster. But H2O can’t have been all that costly back then, it is Ireland afterall. I too, have issues with puff, I was a martyr to chest infections, 3/4 a year, only lately found I have profound issues with milk. So drawing a full lung whilst in the water was impossible. Nor could I draw in enough at the end to get me across the length. I too was an adult before I could swim a length. I learnt in a Victorian pool in Acton, a gorgeous building, half train station half Turkish bathhouse. That I think got a face lift in recent years. It was also the place I darn near drowned too. When the then girlfriend who could swim like a fish wrapped her legs about me expecting me to I don’t know what, but Vince sank like a stone. I didn’t speak to her for a full day afterwards. Your comment prompted a bout of asthma inducing laughter!